In April of 2012 I began the search for a means of improving the physical fitness of my wife and me. Except for maintaining the yard and an occasional hike, and my wife keeping an immaculate home, we lived a somewhat sedentary lifestyle. We were fortunate to link up with Jason Runyon as our Physical Trainer. After an initial assessment, Jason started my wife and me on a workout and healthier eating regimen that quickly began showing results. So we were soon seeing all the benefits of becoming fit! What was the mission, goal and purpose of all this? Just to be healthier? I questioned this and the concern that without additional motivation we may not have the resolve to maintain this new regime. We wanted to continue this new lifestyle without excuses! I learned of The Warrior Dash through friends of our granddaughter. Although having never entered a race in my adult life, this 5K mud entrenched obstacle race sounded like fun and the goal and purpose I was seeking. Without hesitation Jason said it was achievable and we can do it together. Jason focused my training on upper and lower body strength along with learning how to run all over again in preparation for the race. 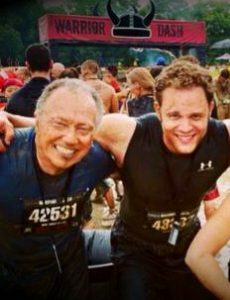 On June 16, 2013, Jason and I ran the Illinois Warrior Dash. To his word, Jason was with me every step of the way with encouragement and guidance. While there was not a specific age group category for me, I did have the fastest time of the three entries of my decade that day. Do you know where you are going and do you have the resolve to get there without excuses? I did and so can you! With the help and support of Jason anything is possible. Jason works with you to develop your goals and objectives, then taking all of your attributes into consideration works with you to achieve and sustain those results.